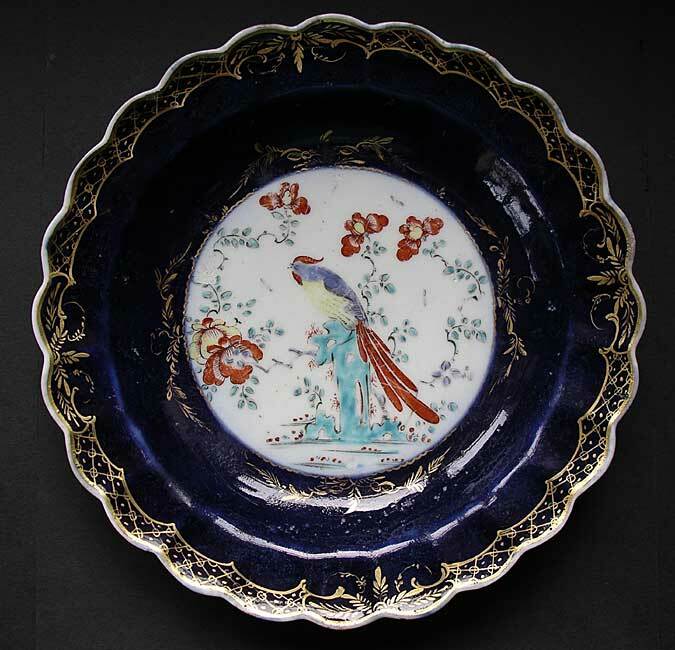 "A fine First Period Worcester, wet-blue ground, Sir Joshua Reynolds pattern dish with classic Kakiemon Ho Ho bird decoration. Framed with gilt rococo borders, the centre is typically painted in the colours of 'old Japan' style. Many Japanese Kakiemon type designs were copied or adapted by the leading 18th century porcelain makers. Worcester gros blue pieces and blue scale remain among the most popular with collectors. They are often the first designs that come to mind as representing classic 'old Worcester'. Examples are understandably prized for their decorative qualities." Antiques Expert Hamilton Bear. References: see R.L. Hobson, Worcester Porcelain, 1910. (Quaritch) for section discussing this design, Kakiemon influences and the Ho Ho bird. See plate XXXIV for illustrations. 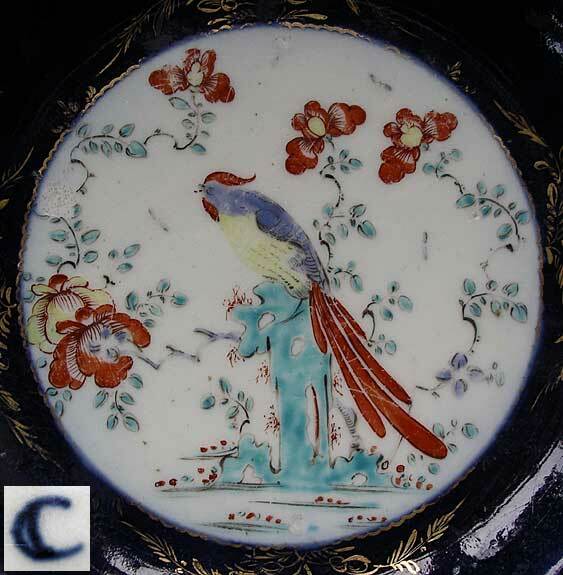 The Ho Ho birds are also found on Chelsea and Chantilly porcelain. Although this pattern is traditionally known as the Sir Joshua Reynolds pattern, there is no definite evidence to confirm that this great English painter ever owned a service so decorated. Dimensions: width 192 mm max. 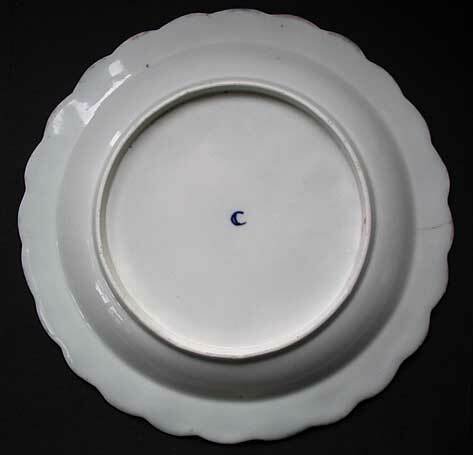 Marks: open crescent in underglaze as illustrated. Unusual: as mostly fretted square marks are found with this pattern. Condition: The piece displays very well and overall is excellent. Condition report: no restoration. Small tight hairline to reverse edge of dish; minute rim chip and wear to tiny area of rim - unobtrusive and difficult to spot. 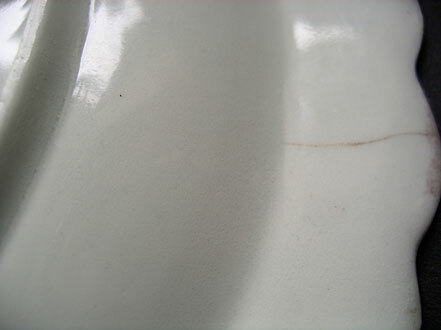 Typical fine transparent scratch marks caused by cutlery use visible in centre well of plate when viewed with angled spotlight. Some crystalline roughness to wet blue ground from firing around 225 years ago.